The University of the Ozarks at Clarksville is affiliated with the Presbyterian Church USA and located on a campus that covers 30 acres in the foothills of the Ozark Mountains. Founded in 1834, Ozarks was among the first coeducational schools west of the Mississippi River. It has posted a number of “firsts” through the decades. It was the first college in Arkansas to admit women in 1875, the first historically white college in Arkansas to graduate a black student in 1959, the first historically white college in the state to have a black student compete in intercollegiate sports in 1963 and the first college in the nation to establish a program for students with learning disabilities in 1971. In September 1991, Ozarks celebrated its centennial year at its current location. In October 2009, the school celebrated its 175th birthday. And in October 2011, almost 400 people took part in a celebration in the new Rogers Conference Center to mark the successful completion of the $40 million Promise of Excellence campaign. More than 4,000 donors contributed to the campaign. In 2003, The Chronicle of Higher Education featured Ozarks in a front-page article about small colleges that revived themselves by building on the strengths of their highly personalized environments. What’s now Ozarks was founded as the Cane Hill School in Washington County. It became Cane Hill College in 1852. After four years of negotiations, the Cumberland Presbyterian Church moved the school to Clarksville in 1891, changing the name to Arkansas Cumberland College. 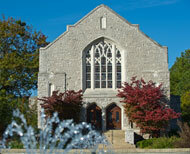 The name was changed to College of the Ozarks in 1920 and changed again to University of the Ozarks in 1987. Dr. Richard Dunsworth became the school’s president in 2013.